Basic strategy for a single deck Blackjack table is easier to remember if you can remember the colour coordinates. In the tables below you will see hard hands and soft hands. You should use the vertical side to the table the player’s hand (your hand) and the horizontal width of the table as the dealer’s hand. Your action will depend on the rules of the table, so if you cannot ‘Double Down’ then you would ‘hit’. Likewise if you cannot ‘Surrender’, you would ‘hit’. The basic strategy is just simple memory, but there are a lot tables to memorise. 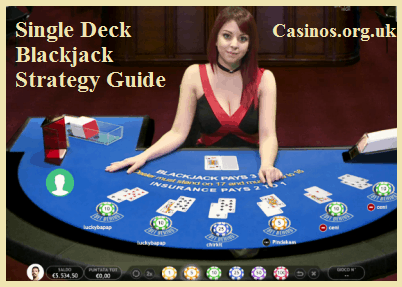 On some online casinos they have games such as Premier Blackjack, the game will tell you what the optimal strategy is. Some players chose to follow this; while, other will ignore it – however – this is the way Blackjack should be played. Many mathematical geniuses have come up with these tables and so they are hard to ignore if you are serious about your Blackjack! Most players prefer to see the dealer ‘hit’ a 17 hand because the likelihood is that the dealer is going to bust out with a larger percentage of cards in the pack (anything above a 4) virtually guaranteeing the dealer hand will be deemed bust. As a result, if the player made the wise move to ‘stand’, the player will be paid for all hands bet versus the dealer. Only on rare occasions does the dealer draw an Ace, 2, 3 or 4, which is usually enough to take the hand down. In the 3 table scenario below if the dealer has a soft 17 hand, then the dealer will ‘stand’. As you can see below there are quite a few options such as ‘Double/Hit’, which means ‘Double’ if the table allows you to do so, or if not, then you can ‘hit’. As with any complicated mathematical equation, the odds can slightly shift with the smallest of change in variables. As opposed to the above 3 tables that are used for single deck Blackjack games where the dealer must stand on 17, in the tables below your actions will slightly change according to the way the dealer plays on soft 17, which on many tables is to hit when he/she has a soft 17 hand. As you can see there is no 10-10 or 5-5 hand on any of the basic strategy hands for splitting. This is because these 2 hands count as hard hands 10 or 20 according to the tables above the split strategies. That means you can still split both these hands and then use the above 2 tables to calculate your next move, but it is better to just use these hands as 10 or 20. For example, according to both tables, hard/soft, with any 20 hand you would always ‘Stand’. If it is a 5-5 hand, then play this as a 10 – this means if the dealer has a face up card of anything between 2 and 9, then you would ‘Double’ if permitted or if ‘doubles’ are not allowed, then you would ‘Hit’; however, if the dealer has a card with a value of 10 or an Ace, then you would always ‘hit’ your 10 and not waste your time doubling on a deal that favours the dealer. If there is no way of splitting because the table does not allow you to re-split a paired hand more than a certain number of times, and you have already reached that maximum, then you need to ignore the table labelled soft hand and treat the hand as a hard hand if possible. This usually occurs when re-splitting is not permitted on the table. Always avoid the Insurance Bet. It is not a safe bet, and the odds are as near as dammit 5.9% in favour of the house when you are playing single deck Blackjack. Avoid sitting at tables where Blackjack pays less than 3 to 2 odds as this dents your odds of winning money back or minimising you losses when playing the basic strategy, which is the optimal strategy. There are often tables that make up for the fact that Blackjack is paid at less than 3-2 odds, but make sure these side bets do not outweigh the odds of your being paid a 3-2 on Blackjack hands. Some games such as Australian Pontoon can make up for this in other ways that are fair for the players; however, games that offer no compensation for offering lower then 3-2 should be avoided. If you have any questions about optimal strategy or any other Blackjack queries, please visit our online blackjack FAQ section. Also, feel free to send in your questions, and you never know, we may be publishing your enquiry on our site!